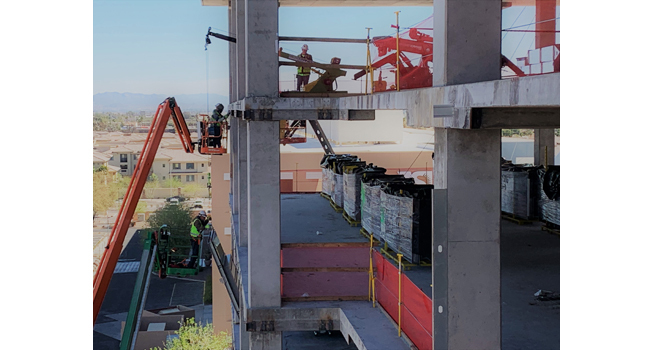 KT Fabrication of Chandler, Arizona procured two M1 Global Model Microcranes® to help install curtain walls from the exterior of buildings to minimize large crane rentals, speed up production and lower costs. The M1 Global design fits through 91 cm doorways, narrow aisles and inside elevators, yet expands to boom up to a 75 m tip height. The multi-purpose lifting crane has several configurations including a roof top configuration allowing floor to floor or ground to roof lifting of materials of up to 7 stories. Safety is a priority for KT Fabrication. The ISO Certified M1 Global is built to ASME standards, exceeds OSHA standards and is CE Certified to meet international standards. Safety features include an upper limit switch (anti-two-block), 1.5 load safety factor, 4:1 rated hook with safety latch, brakes on rear and front wheels, brake on winch, dual stop points on four-piece boom and a winch shield. The recently released M1 Global hydraulic pick & carry portable crane is rated at 905 kg (no operator license required) and has a hook height of 6.1 m. It is only 762 mm wide and weighs 816 kg dry weight. To learn more about the Microcrane® visit: www.smartrigcranes.com.